Let’s reconsider that last statement. I am NOT calling all of my readers losers. Well, I don’t think so anyhow. I am actually just saying that if I have blown your trust to smithereens, although it may be my fault entirely, if you don’t believe me this time, you will be so, so sorry because this IS the BEST chocolate cake I have ever made (I am fairly certain). This Chocolate Feather Cake from Rose Levy Beranbaum in Heavenly Cakes is actually heaven on earth and so aptly part of her well named book. 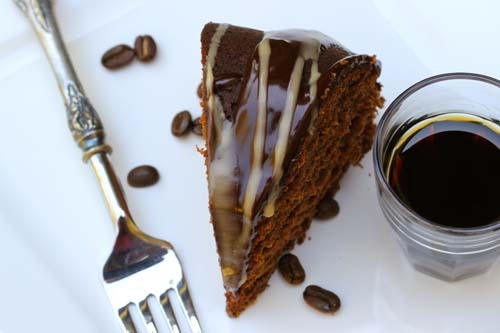 Part of the Kahlua cake photo shoot…white backdrop with external lighting. But, of course, I Genified it. Basically, in layman’s terms, I got it good and drunk. It was a birthday cake for my cousin, and I was certain that a celebration cake warranted a little extra spirit. So I switched out most of the water for Kahlua, threw in some Espresso, added a Kahlua Ganache AND a Kahlua icing, and oh boy. It literally might make you dance and sing—um— on the table tops mind you, preferably clothes still on. The texture is feathery as its original name implies, and the flavor is rich and so very chocolaty with the extra zing from the liqueur and Espresso, and the word, “mmmmmm” can’t help but escape from your mouth. Perhaps that is the only logical explanation for why this cake was mysteriously missing two slices from the bundt ring that I made him. Note that Sadie is waiting for one false move and it’s all hers. —Which is why I decided to slice it up and place it on a platter instead of serving it as a whole cake. I don’t think he suspected a thing. But, in my defense, I HAD to taste it first before giving it away as a present. It was my first time making this cake and I had messed with the recipe so entirely that it didn’t really resemble the original version so I HAD to know that it was up to par. Right? Glad we agree. Thanks for having my back. I will officially retract my original statement about you being a loser. Make the cake, eat the cake and have a better life. That’s all folks. 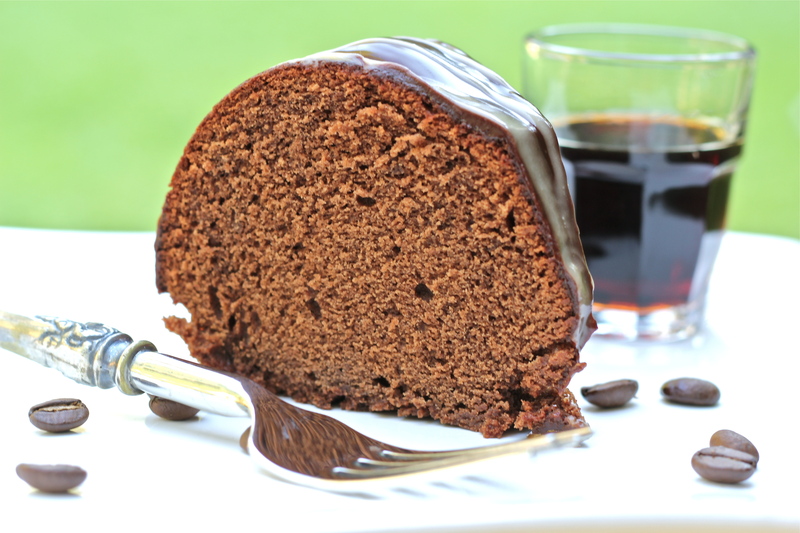 To Make the Cake: Place Kahlua in a microwave safe dish and heat for one minute on high to boil it. Place your cocoa powder into the hot Kahlua and whisk until smooth. Add the 1/4 c. hot water to thin it out a bit. Let rest while doing all other steps. Take one rack out of your oven and place the bottom rack in the bottom third of your oven. 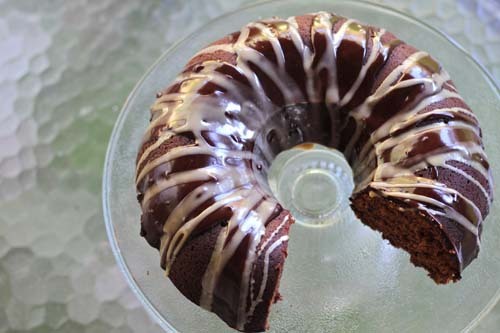 Preheat your oven to 350 degrees Fahrenheit and grease a bundt pan with nonstick cooking spray. In the bowl of a stand mixer fitted with the paddle attachment, combine the flour through salt and mix on low speed to adequately disperse the dry ingredients. Add your butter and chocolate mixture to the dry ingredients and beat together on medium speed until fairly creamy. In a medium-sized mixing bowl beat together eggs, vanilla, Canola oil and 1/2 c. of water. In a very small microwave safe dish, heat the 2 T. of water for 30 seconds. Add the 1 T. of espresso granules and mix together until espresso dissolves. If the espresso does not dissolve, heat it up for another 15 seconds or so. Add the espresso to the liquid ingredients. Pour the liquid ingredients into the chocolate batter and mix on medium-high speed for a minute or until creamy and smooth, scraping down the bowl now and then. Pour batter into prepared pan and bake on the bottom rack (which should be on the bottom third of your oven) for 45-55 minutes or until barely firm when touched and toothpick comes out clean. It may need longer with a silicone bundt pan but I have not used one so I wouldn’t know. To make the ganache: heat the chocolate pieces and butter in a microwave safe dish for one minute. Stir, and heat for another 45 seconds or until fairly melted. Stir until smooth. In a microwave safe liquid measuring cup, heat the cream and Kahlua for 45 seconds or until hot but not boiling. Pour the hot cream mixture over the chocolate mixture and whisk until smooth. Let cool a few minutes before pouring over cake. Use the liquid measuring cup to drizzle the ganache back and forth in a “v” pattern over the cake. Let the cake sit at least 30 minutes before pouring Kahlua Icing over, or refrigerate for 15 minutes. I measured nothing. I simply threw some powdered sugar in a liquid measuring cup (maybe 3/4 a c.) and poured in Kahlua until it was drizzle-able (is that a word?) Then I drizzled icing over ganache back and forth in a “v” pattern again. BONUS RECIPE! Kahlua Truffles Save extra icing and ganache to serve as an added sauce with the cake if you like. They are DELICIOUS! Or, what I did, was combine them, refrigerate all day and later scoop them into balls using either a small spoon or mini ice cream scooper. I rolled them in unsweetened cocoa powder and voila, I had the most amazing Kahlua truffles in history! This is fantastic! My tastebuds are doing a little dance just thinking about it. Really beautiful too! You’ve totally convinced me, and now I can’t stop thinking about this cake. I love that last photo of the double iced top, great post! I spent waaaay too much time taking photos of this doozy but I do appreciate the compliments. 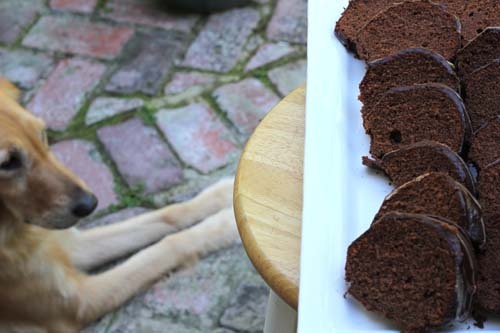 This cake… oh my gosh this cake… can I just have a crumb if you don’t want to share?? I would gladly share a whole slice with you! You had me at kahlua!! Geni.. this is hands down one of your best posts.. from the recipe to your description of it.. you’ve got me wanting a slice!! Why thank you Barb. I’m glad I have thoroughly convinced you. You are a marvel, Geni! This cake and icing sound positively fantastic. And then you go and add the tidbit about making kahlua truffles. OMGenie! You are too much! I’m a marvel?! I like that idea. If only we could share that information with my son. That looks sinful and delicious. I will cry whatever you like for a slice of this – so clever serving it the way you did – I must remember that! You don’t have to cry Mandy…I’ll be happy to make another cake and share. The cake looks fanstatic. I notice the slices missing were big slices, can’t say I blame you! I don’t think you are crying wolf at all just making increasingly delicious things. This cake looks amazing! I like the way you think Janna! I cry wolf just about every day also, so I totally get it. But I trust rose levy and YOU with my cakes any day so if you say it’s the bee’s knees then it for sure is! I appreciate the high praise when you use my name with Rose’s name, I get goose bumps. 🙂 Your food is always worthy of top marks as well. Geni, I think it is very irresponsible of you to show these pictures and leave us with no immediate outlet. I am bound to go chew on a chair leg or something. I love Rose’s cakes, and even more love inspired baking. This is a beautiful creation. Kahlua + cake = love!!! yum yum yum!! I think I will make this soon! I so wish I could share one with you…and the Kahlua truffles…those are crazy, delicious…I think I need a separate post on those guys. It’s not crying wolf, Geni – it just means you’re getting better and better, right? And oh dear lord, does this sound heavenly – and I don’t blame you one bit for trying a slice. (and then another). Hugs! I changed it. If the grammar police comes to my door, I am saying it was all your fault Caroline. 😉 Thanks for the high praise! Geni this sounds absolutely amazing! Can’t wait to give your “genified” version a try :)! Sin. Pure sin and joy. That’s a very strong recommendation! How could I say no? Oh. My. This cake looks incredible! I’ll have to give it a try sometime, and soon! o my…this is deadly chocoatey and and I am totally tempted! Geni, your photos are stunning! I love that last shot. I bet this tasted incredible. Isn’t Rose the best! This looks incredible. Wow look at that icing! It makes it look even more delicious! Love how you added Kahlua to the cake and the icing, good move. I’ll bet your cousin was thrilled enough to dance on the tables. wow, love the pictures and the cake looks absolutely divine! Kahlua cake topped with gnache and icing?! Decadent. And you never know if it is worthy for gift giving unless it passes the taste test! chocolate, kahula, ganache, double ganache, truffles! You are amazing. What a cake! How did I miss this post! I am playing catch up with reading my fav bloggers posts. This is a winner. I’m having a pampered chef party and will make this even though it’s not a PC recipe! Yum!!! I didn’t see when to put the canola oil in the instructions. When would I do that? Can’t wait to make this cake. Thank you so much for not only noticing that but mentioning it in a comment so could correct it. 🙂 Hope your cake turned out great! Just made this and used two double round pans and made it a double layer cake and it doesnt look pretty but it tastes amazing!!! Great recipe! Yum! I’m looking for a kahlua cake recipe as I have a bottle of kahlua lying around for too long! Now that I’ve read your recipe, I know for sure the kahlua’s going to be gone soon! I am trying this recipe put as a 3 tiered wedding cake. I didn’t think it was as dark as strong in coffee or kaluha as it sounded it would be. What do you think about upping the amount of kaluha? I am making a 12 in, 9 in, and 6 inch tier. Are they going to be sturdy enough to slice in half to fill? I am making a mocha buttercream filling and covering it in ganache. Any suggestions? Thanks so much for the recipe! !-and deliver it on Monday unassembled. Decorating with a simple border and edible orchids. I’ll post a photo when it’s all done-thanks for your help! Thank you so much for the report back. I will try to find you on Facebook then for the pics! 🙂 Glad it got rave reviews. Did you end up adding extra KAhlua? If so, how much…did you subtract oil? Thanks for the info. Take care! Sorry to take so long to respond. I just really want you to know how special this cake was! Such a hit. I did add extra Kahlua and I made an incredible mocha buttercream. I often don’t like them because they are either too buttery for my taste (if a true Swiss Buttercream) or too sugary sweet if the more American confectionery sugar variety. The one I used was just delicious and complimented the cake perfectly. 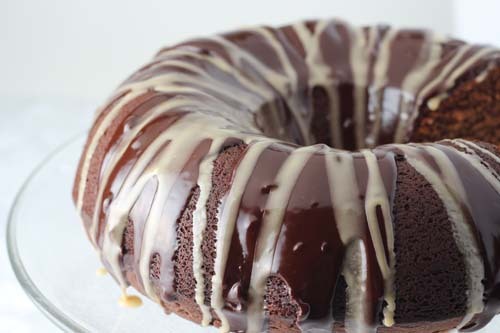 The ganache was also laced with Kahlua–all 3 components were! The cake was moist, tender and oh-so yummy. Tomorrow the bride will be posting her testimonial to your cake on my page. On to the Christmas baking season-hope yours goes well! HI Kali, what is your site? I would love to go there.